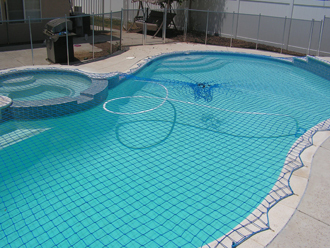 Desert Pool Guard Pool Nets are a safe and beautiful way to secure your swimming pool. Pool Guard Pool Nets are certified and tested by a nationally recognized safety product testing company. Every pool is a potential danger for babies and young children; Pool Safety should be priority one for all families with a swimming pool. Pool safety nets provide a safe barrier to protect babies and young children while preserving your view. Pool Guard Safety Nets designed their pool nets to allow easy removal and re-installation of the pool net over the pool, with a series of pulleys and ratchets that allow the average person to remove and re-install the net over the pool. Pool Guard Safety Nets also provide a net roller so a user can roll the net up and store it easily in a safe place when not in use. Call us today to get your custom pool safety net estimate. Pool Guard Pool Nets are a safe and beautiful way to secure your swimming pool from your toddlers. Nets can bring numerous benefits to your family and your back yard, providing safety to your family and preserving your deck space and view. 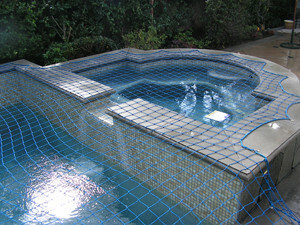 PoolGuard netting is easily placed over the pool in about five to ten minutes and can be removed in less time than it takes to place back on. Small anchors are drilled and secured into the pool decking every two and a half feet around the pool. These Special Pool Guard anchors are unique to the pool safety industry, pool guard manufacturing uses a polyurethane glass composite anchor that not only holds a firm grip in the concrete but has a concrete color to it, allowing it to blend into the color of most decking. Brass anchors can dis-color over time but more importantly they can slip out of their hole when placed in certain types of aggregate. Net are made of a durable high density polyethylene braid that has proven through test will comply with the 485lb. required by most states and meting California’s ASTM standards. The net has maximum U.V. stabilized inhibitors so as to not allow shrinkage or fade in harsh environments. The mesh size will prevent a toddlers head from penetration, but also large enough so children can not easily move about. Most are very hesitant to step on a net and see it as barrier. California has numerous applications for netting due to the size or location of Southern Cal back yards. If you are in a small lot in Orange County or have a view of the Coachella valley, the net can work for you. 4. Improper reinstallation by owner. Owner should always check to be sure net is installed with proper tension and all clips are firmly in place.